When someone compliments us this is a natural reaction for many, as they feel embarrassed, they don’t believe it, they feel they are not worthy or good enough of the compliment. “What if you were able to say a simple thank you”? Then really experience the feeling of joy and happiness at being complimented. Really sitting with that feeling for 20 or 30 seconds and letting it sink into your minds, body, soul and sub-conscious. 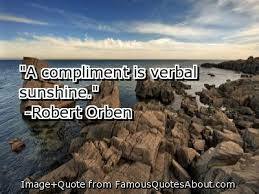 Wouldn’t it be nice if you said to the person complimenting you; “Thank you, if you don’t mind, I will sit and experience this feeling of happiness, or joy that I am feeling for a few seconds.” Not only does it make you feel good, it makes the other person feel good as well. A friend shared with me when having dinner with friends, someone complimented her on her dress and how lovey she looked. She immediately launched into a subject that had no relevance. She realized afterwards, the way she should have responded to her friend, was saying “thank you, and I will sit with this feeling for a few seconds and allow it to soak in”. By doing this her friend would have felt really good at the same time. Win-Win. The exercise of sitting with these feelings of being joyful, happy, or really appreciating something beautiful for 20 or 30 seconds, and allowing those feelings to soak deep into your body, mind, soul and your sub-conscious. You are creating more joyful and happy moments into your lives, and you are raising your energy levels and vibration. When you are sitting in this energy of joy, happiness, peace, love, this is the vibration that is radiating out into the universe. This vibration energy allows you to attract in, and manifest many wonderful opportunities or desires you want to achieve in your lives. Plus you are creating more positive moments into your lives, more joy, happiness, which you are radiating out to the people around you, which in turn impacts them in a positive way. We are coming into the festive time, and what a wonderful opportunity to practice this exercise at this time of year. When you are complimented or given a present that you were not expecting say “thank you” and really experience the feeling of joy. Being given a present from someone you were not expecting one from, is a wonderful way to really put this exercise into practice. By feeling and experiencing the joy, happiness, the surprise, and really appreciating the gift by saying “thank you”. Instead of covering up your embarrassment by saying “you shouldn’t have”, or similar comment. Have fun in doing this exercise , and start making it a practice in your life on a daily basis. You may be surprised what positive and wonderful things come into your life.